The winter temperatures in Ohio are too cold for a palm tree to grow outdoors, but an indoor potted palm tree will add a tropical feel to any room in the house. There are several varieties of indoor palm trees with each having different light requirements. Monitor the palm tree for the first two or three months of growth to verify there are no problems. Plant an indoor palm tree in a container that is 2 to 3 inches wider in diameter than the root ball and filled with a well draining, nutrient rich houseplant potting soil. Drill bottom drainage holes into the container if they are not present. Place the palm in an indoor area that receives filtered sunlight with a temperature of 60 to 75 degrees. Monitor the plant and move it to an area with brighter sunlight if the leaves begin to turn yellow. Apply water to the palm tree once the soil feels dry to the touch to a depth of 1/4 inch during the spring and summer months. Water the palm tree once the soil feels dry to a depth of 1 inch during the dormant winter months. Mist the palm tree with water two or three times a week to increase the humidity level if the area is dry and there is no humidifier available. Fertilize palm trees with a balanced water-soluble fertilizer once a month from early spring through early fall. Monitor the palm leaves and skip a fertilizer application when the plant receives adequate water but forms dry leaf tips. 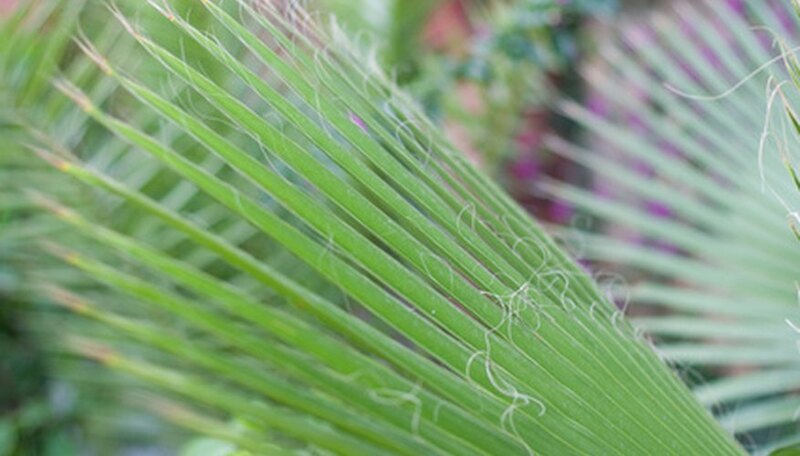 Monitor the palm fronds on the stem of the plant for the presence of spider mite insects. Spray the plant with water to remove the insects and apply an insecticidal soap solution if there is a continued problem. Periodically wipe the fronds with a damp towel for prevention. Do not place palm trees in areas where there are cold or hot drafts or a heat register.